Having been in operation for over 20 years, UniBet are undoubtedly one of the leading names in the world of online betting. Licensed and regulated by the British Gambling Commission, UniBet offer a good range of sports markets, along with a variety of generous promotions for both new and existing customers. Mobile customers are also able to take advantage of their efficient app, which makes wagering on the move easier than ever. This review will take a detailed look at their entire operation, especially in terms of the UniBet sign-up offer, as well as other UniBet promotions. Enter the UniBet Sports website via desktop or mobilee. Click on the “Register” tab located in the top-right hand corner of the page. Enter the relevant personal details, including your full name and email address. Verify your account via email. Deposit a minimum of £10 using your preferred method of banking. Place an opening sports bet with UniBet at £10 or more. Use your bonus funds within seven days. 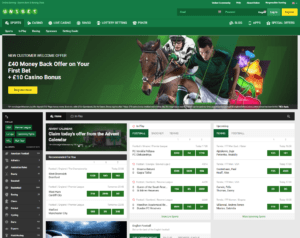 As well as their generous welcome offer, UniBet also provide a number of ongoing promotions in which existing customers can take advantage of. Such promotions can help to both maximise winnings and minimise losses, whilst they also cater for fans of different sports. Firstly, customers are able to earn themselves a £60 free bet by referring a friend at UniBet. Customers are able to refer up to five friends, meaning that a total of £300 is up for grabs. As well as this, the UniBet “Penalty Payback” promotion means that customers can earn themselves up to £100 in cash refunds if a penalty is awarded in either a Premier League or Champions League matches. This effectively means that all losing bets will be refunded, should a penalty be awarded during the 90 minutes. Elsewhere, UniBet delivers best odds guaranteed on all UK & Irish horse races, meaning that punters will receive winnings at the best possible price, no matter when the bet was placed. Due to the fact that UniBet sponsor many of the teams involved in the English Championship, the bookmaker provides a range of offers revolving around Aston Villa, Blackburn Rovers and Preston North End throughout the season. Customers will receive refunds up to £20, should their first, last or anytime goalscorer bet prove to be unsuccessful. Finally, those who enjoy placing multiple bets will certainly be pleased with UniBet’s multi-boost promotion, allowing for extra winnings up to a massive £5,000. A stake of at least £20 is required in order to quality, while each selection must have odds of 1/5 or greater. A 10% bonus is available on 3-fold bets, while 20% and 30% is on offer with 4-fold and 5-fold bets respectively. The UniBet in-play free bet club is perfect for those who enjoy live betting, with a £10 free in-play bet being up for grabs on a weekly basis. Customers must opt in and place five or more in-play bets between Monday and Sunday on football, tennis, cricket, darts or basketball markets, with a £10 free in-play bet being received the following Monday as a result. It is worth keeping in mind that qualifying bets must also be placed at odds of Evens (2.00) or greater, while free bets will expire seven days after being rewarded. The UEFA Champions League is undoubtedly the biggest club competition in football, with UniBet offering their customers the chance to win £50,000 by predicting the scorelines of four matches from the tournament. This free to play promotion is well worth taking advantage of, with £10,000 going to the user who finishes top of the leaderboard, in the event of the main prize not being won. Available every round of the competition, customers must successfully predict the scores from two matches on a Tuesday and two on the Wednesday, with 30 points available for the correct scoreline, while 10 are on offer for the right result. UniBet undoubtedly offer one of the biggest range of markets online today, with over 40 different sports available to bet on at present. The likes of football, tennis, cricket and basketball perhaps unsurprisingly feature heavily in both pre-match and in-play markets, with over 50,000 different options for fans of these beautiful games. UniBet also cater for fans of more obscure disciplines, including the likes of curling, bandy and trotting, demonstrating their diversity. As well as this, the introduction to their sportsbook of politics, television and entertainment markets helps to make them a unique betting platform. The UniBet mobile app offers a convenient and efficient betting platform for those constantly on the move, offering all of the same features as found on their main desktop site. The app is available to download for both iOS and Android users, with the streaming of over 10,000 live sporting events, in-play betting and the receiving of important notifications made easy thanks to the work that UniBet have clearly put in for their mobile customers. Those looking to download the app using their iOS device can do so by finding the relevant link via the App Store, while the process is a little trickier for Android customers. Android customer must ensure that their device is set up to accept downloads from unknown sources, before accessing the link via the UniBet mobile website. Cashing out allows customers to settle bets before the completion of all selections found on their bet slip, meaning that they are always in with the opportunity to secure funds for the future. Cashing out at UniBet is available on over 20 pre-match football markets, live football markets, outright football markets and tennis outright markets. The cash out logo will appear on user bet slips when available, with a proportion of the potential winnings offered by the bookmaker. Live streaming is available via the UniBet desktop site and mobile app, with football again forming a major part of this feature. The bookmaker streams every match from some of Europe’s most popular competitions, including the French Ligue 1, German Bundesliga, Spanish La Liga and Italian Serie A. The ability to simultaneously watch and bet upon the action as it unfolds has long been a favourite option for punters, with UniBet adding more and more streams as time passes. In-play betting is also a major attraction for potential customers at UniBet, with punters being greeted with all ongoing events as soon as they enter the sportsbook. Odds are automatically updated on a regular basis in order to keep in line with the scorelines of matches, with this form of wagering offering some excellent chances to win big. There are a number of available methods when it comes to both depositing and withdrawing funds at UniBet, including Visa and Mastercard, along with increasingly popular e-wallets such as Skrill, Neteller and Webmoney. All methods all for immediate deposits, while UniBet withdrawal times range from 24 hours to seven days. Minimum deposits at UniBet start at just £5, while maximum withdrawals will differ from sport to sport. 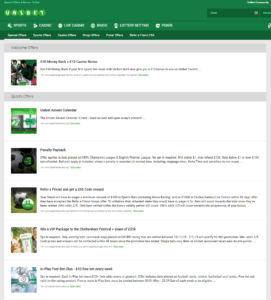 It is clear to see from our review that UniBet are an excellent all-round bookmaker, with their sportsbook offering a fantastic amount of markets and additional feature, which help to ensure for an enjoyable experience across the board. UniBet perform well when it comes to live-streaming, in-play betting and cashing out, which are among the most in-demand features for punters today. The generous welcome offer should also help to attract new customers, while their range of ongoing promotions also helps to set them apart from other platforms.